Alot of disputes regarding the new Keystone Pipeline that is slated to traverse the entire United States from Canada to Texas. 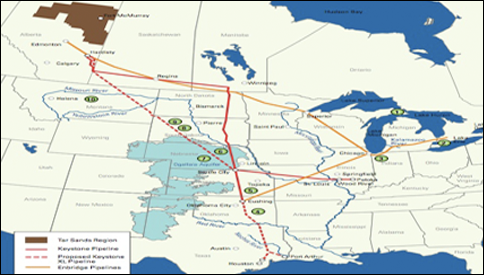 There is already a Keystone Pipeline leading from Canada through seven US states – North Dakota, South Dakota, Nebraska, Kansas, Missouri, Illinois, and Oklahoma. So what is the argument about a new proposed pipeline leading from Canada through Montana, South Dakota, Nebraska, Kansas, Oklahoma, and Texas? Those opposed to the new pipeline are arguing on the side of environmental concerns. They worry about lands being taken from the people and oil leakages. If a leakage occurs in a specific area, they fear it will contaminate the water supply to thousands of people. Those who support the new oil pipeline stand on the side of labor and how many jobs will be created in not only building the pipeline, but maintaining it. There is no doubt that the landing places for this new pipeline has a mass of refineries. However, there are also oil refineries in Montana. While the refineries in Montana may not be large enough to refine the oil production the new pipeline will produce for America, building new refineries will also create jobs both in the building phase as well as the maintenance. It will also help produce jobs for over-the-highway tanker drivers. So the real question lies with the alternatives – Do we build a pipeline from northern border to coast, passing through six states, where the oil will end up at refineries where the exportation of the refined oil can be readily available without the extra costs of shipping, yet at the supposed disadvantage of potential environmental concerns? Or… Do we build a new refinery closer to the Canadian border, at a lesser cost than it would be to build the massive pipeline, and ship the refined oil to multiple coasts for exportation? The bigger questions would then be, who benefits the most with the enormous cost of the pipeline construction where the oil ends up being refined and then shipped from both the Texas and Louisiana sea ports? And what of the prices of our newly refined oil? Which of the alternative will help the people of the United States the most with regard to both gas and oil prices and the potential hazards to the environment and the costs of such disasters if they should occur?